Decorating a bathroom can be a tricky business because there is little wall space, or often little space at all, to play around with. It can also often be expensive. So whether you want to give you existing bathroom a makeover or you are creating your theme from scratch, here are the top 10 decorating themes to get your creative juices flowing. To add a touch of luxury and sophistication, you need look no further than the Mediterranean or Tuscan themed bathroom. Use texture and tiles wherever you can, in earth tones and dark cream. Tiling up the side of the bath, makes it more a part of the room's scheme - as if it has been sunk into the room. Accessories should be opulent gold features, including taps and other small bathroom fittings. Flooring should be tiled. Usually large natural colors, but can employ the use of mosaic in the center of the room with a pattern, or to define the edges of the room. Dark wooden units are used, in contrast to the lighter colored tiles. Mirrors, glass and more ornate light fittings are used a lot in the way of accessories. 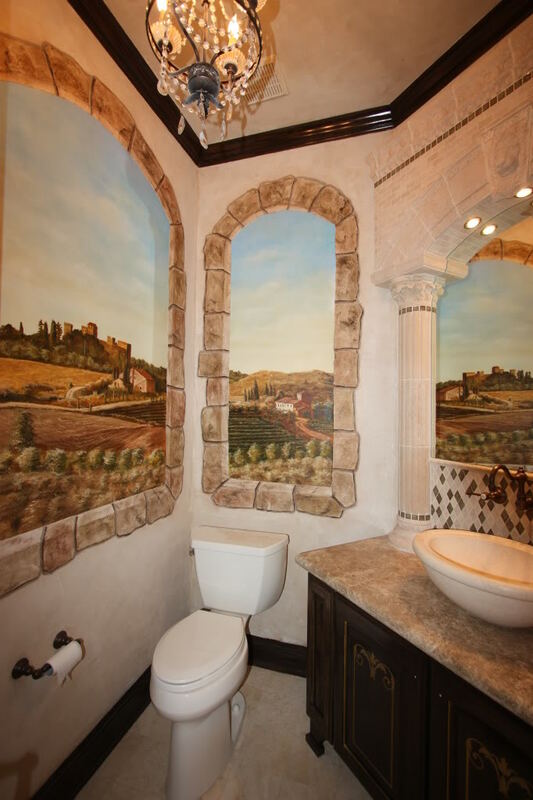 Of all the bathroom themes this is the most relaxed. Open to interpretation, by either going the nautical route or the beach route or a combination of the two, is a style that suits the whole family and offers the opportunity to imprint a lot of personality onto the room. Either use natural beach theme colors to echo the ocean and sand, or use the nautical combination of red and relaxed denim blue, or navy blue. 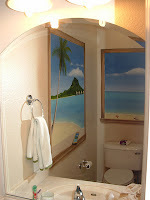 Try creating your own mural, or paint small features directly onto the walls, such as lighthouses, shells or boats. Make it a more surfy theme with a surfboard or body board hung on an open wall. Use shells and pebbles around the bath, sinks, and on top of a toilet cistern. Tongue and groove wood paneling around the room, up to about waist height, and paint it white, or sand it down to a rough bleached driftwood appearance. Add small details like anchor light pulls, and rope door handles. Use wall art and frame it in rustic, natural driftwood-type frames. 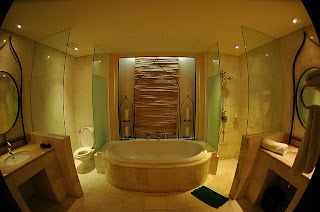 Luxury is the key word to keep in mind when trying to incorporate spa style into your bathroom theme. The atmosphere should be calm, and feel like a retreat - not a style for a family bathroom. Colors are usually white, but can employ more neutral creams and beige, especially in the form of texture. 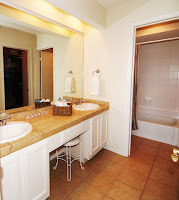 Use his and hers sinks if you have the space, and incorporate lighting around the mirrors above them. A corner bath, sunken bath, or whirlpool bath are worthwhile investments when employing the spa style. Apart from piles of white fluffy tiles that can be stacked anywhere and everywhere, storage should be hidden away, under sinks or in seagrass or rattan boxes. Mood lighting is an important factor. Recessed hologen leds into the ceiling, floor, or bottom of units can be linked to a dimmer switch. Use glass screens to distinguish areas, but keep the room open, and create a good flow. Flooring should be polished tile or laminate. The French classic theme does not employ a lot of clean lines - it is a style that embraces curves and femininity. Vanity units are common in a French classic bathroom, so that the sink's workings are hidden away underneath. Cabinets can be wall mounted or free standing and are usually painted. Try painting faux aged cabinets, to give a shabby chic distressed look. The French classic theme relies on black and white together as a color scheme. This can be in the use of fabrics, wall tiles, or square floor tiles. Toile fabric is heavily used in French classic decorating in the home, and in a bathroom would usually be in the black and white colorway, although blue and white can be happily used. Add authenticity with an ornate mirror, and accessories in the black and white colorway. A roll top, or stand alone bath is a must, with classic taps. Sinks should be pedestal style, with lots of curves and detailing. Flooring should be dark wood - or stained dark. For today's bathrooms then a laminate option would be better that can stand up to moisture. Add details with authentic looking apothecary bottles, and a double sided shaving mirror. 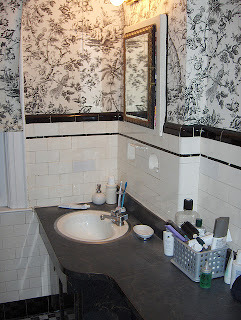 Walls can either employ patterned wallpaper (hard to use in a bathroom because of moisture levels), or wood paneling. As this can often seem dark (as it was in Victorian times), it is perfectly acceptable to paint the paneling, or tongue and groove work, into a neutral color. An uber trendy theme that is constantly changing. A perfect look for a singleton or couple. The look is pristine, clean lines, hidden storage, and square look to taps, baths, and sinks. The only room for curves is on the shower cubicle that can have a curved element to it. Add very few touches of color in either bright pink, lime green, or a black and white combination. Sinks and baths should always be white. Tiles can be used in small areas, such as splashback areas around the bath and sinks but should be monotone. Usually polished ceramic look, but can employ mosaic style with small amount of texture. Shower should be a large, or powerful one with lots of polished chrome elements or black, for contrast. Use gadgets and neat little ideas to the max - for example a pull out floating unit from under the sink, hides away pipes and incorporates shelving for handy storage. This can be colored in contrast to the sink. 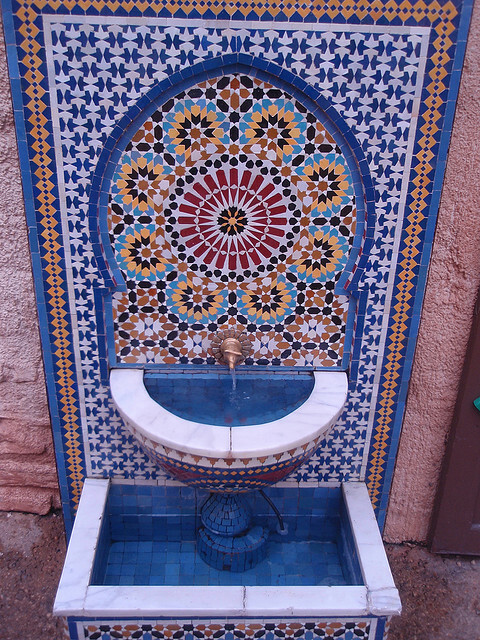 The Moroccan themed bathroom is all about the tiles. 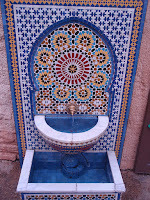 Colors for walls in a Moroccan style room are usually dark sand/terracotta, and often on the floors. If you want a more muted tone of this, then employ stone tiles or matt laminate flooring in a warm cream shade. Bathroom fittings such as taps should be gold or burnished copper, and employ curves or some form of detailing. Sinks can either be very angular and appear floating on top of a unit, or a semi circular affair with added detailing around the edge - add your own detailing with mosaic tiles for a unique touch. 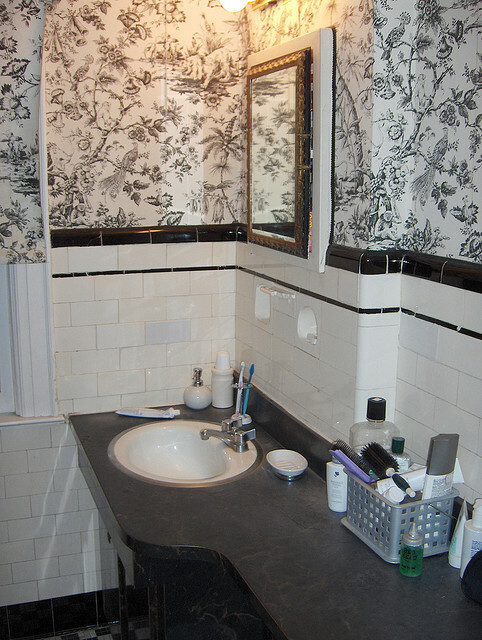 Tiles around the bath edge (top and bottom), the sink, and any other units should use mosaic size tiles in ornate patterns, or checks. 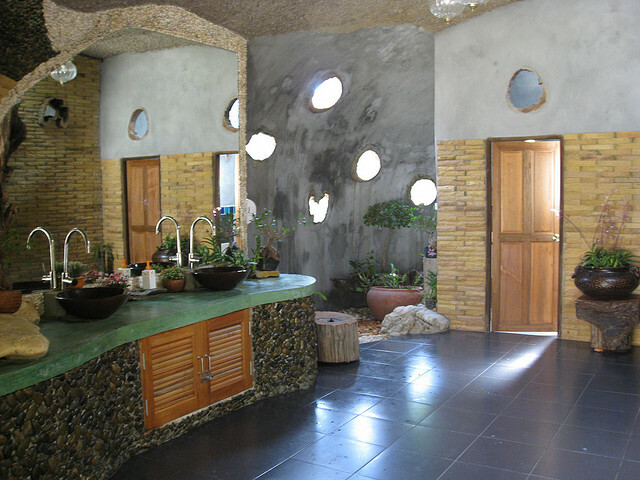 Circles are a common element in tiling. These tiles can be in any color, but avoid overly bright ones used together. Blue and white around the edge is a good frame to a detailed pattern. You can employ some exposed brick work, for a more authentic touch - try using a sponge to create faux brick painting. Colored glass bottles are a great accessory, as are Morrocan style lanterns with tealights inside. The epitome of relaxed style, the country bathroom theme can be made more masculine, with the introduction of darker colors and country accessories, more feminine with checks and florals, or kept simple as a good all-rounder for a family bathroom. 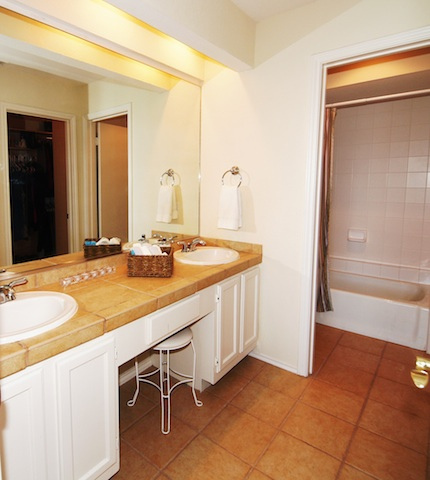 Utilize whatever bath, shower or sink combo you currently have, and add dark wooden paneling or units to it. Tongue and groove paneling is a natural choice and can be stained with a dark oak wax, or painted white according to your needs. Pattern in the form of checks and ginghams can be incorporated into details on towels, or as a small window dressing. Accessorize with colored glassware and small country items like horseshoes, or wooden carvings. Use wicker boxes and other natural products for your storage. 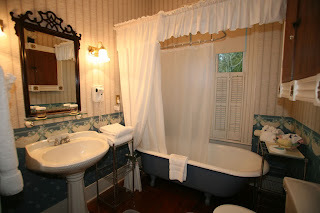 A dark wicker chair in the corner makes a restful stop, or place to store towels. Natural stone tiles or warm earth colored laminate is a good option for flooring. A modern family bathroom has to be practical, but that doesn't mean there's no room for style. It does mean that compromises have to made as this room has to be all things to all members of the family. Storage is an important factor with the modern family themed bathroom, but it doesn't all have to be hidden away. More attractive bottles can be put out to display on glass shelves, towels neatly folded or rolled onto a metal shelf or wire rack also works well. The use of natural grass baskets also incorporates style and texture to the room as well as handy storage. 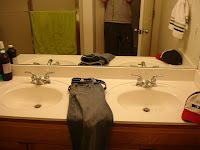 The use of two sinks, if you have room, will save a lot of arguments. 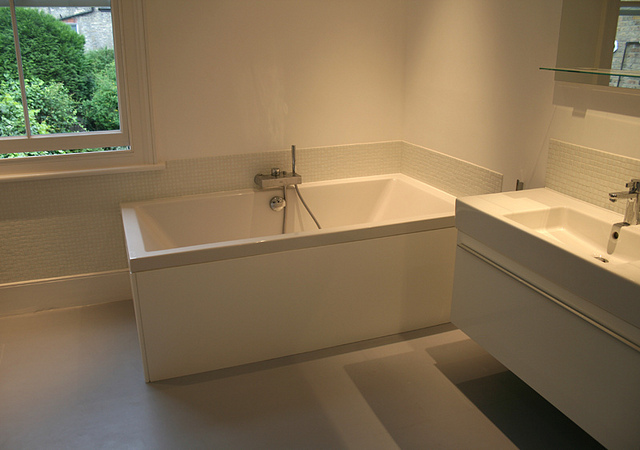 Clean lines for baths, again if you can incorporate storage with a pull out unit at the bottom of the bath then all the better. The modern look this season is to hide away all pipework, sink uprights, toilet cisterns etc, this is a great look for a modern bathroom as it provides not only additional storage, but is a lot easier to clean too - a prime consideration for a busy family bathroom. Add personality to the room with modern taps and fittings, recessed lighting, and the addition of a current color trend like zesty green or berry red. To create a true oasis of calm and opulence, embrace the tropical theme bathroom, where you feel like you're on vacation just taking a shower. Bright colors can be used on the walls, or try and emulate tropical beach feeling using ocean blues, and exotic greens, teamed with sandy creams. Accent with pale green, brown and cinnamon. Incorporate more color and authenticity with the addition of pot plants. Use pebbles and shells either scattered around the edge of the bath or sink, or fixed in place with grouting as you would do with tiles. The addition of a wet room instead of a separate shower unit, especially if you use a large shower head, replicates a waterfall, and keeps a good flow in the room's space. Use curves to echo the waves on the beach. Wooden accessories are a good contrast to the other textures in the room. Whichever one of these bathroom themes you choose to use for your home, make it unique to you with finishing touches and accessories, or use a combination of a couple of styles for a truly unique bathing experience.